Back in April we posted a story from the New York Post on a new tv series coming to Fox that included a Returned Peace Corps Volunteer as one of the main characters. 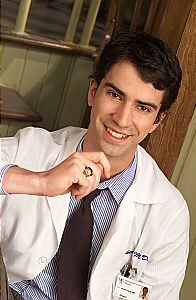 The part was to be played by Hamish Linklater (shown in the photo above) best known for his role as Dr. Bruce Cherry on Gideon's Crossing. James Cann was going to play the RPCV's conservative stepfather in a plot evocative of "All in the Family." Bad News. Perhaps because of the political hot buttons raised in the pilot—buttons some sources think Americans may not yet be ready to have pushed—or perhaps because there are so many pilots made, the show did not get "picked up." In the last issue of the In-Site, actress Mary Birdsong was waiting to find out her fate: Would she get a co starring role on a CBS TV pilot? No sooner had Mary Birdsong returned to New York, following her audition for the as-yet-unnamed CBS sitcom pilot, than she received a frantic phone call from her manager. The network was inches away from signing James Caan, which would make the project a "greenlight." If that happened, Birdsong's agent told her, it would be essential for her to be out in L.A. the next morning to start shooting—even though she had not been formally offered the part. CBS just wanted her out there so they could get things rolling immediately if Caan said yes and she were given the thumbs-up. Her plane landed at LAX. She got a call. You got the part. And James Caan has signed on. The following week, Birdsong began a weeklong shoot in the as-yet-still-untitled CBS pilot in which she would play a single mom living with her stepfather (James Caan), mom (Jill Clayburgh), teenage son (Dan Byrd, of Firestarter: Rekindled), and brother (Hamish Linklater, of Gideon's Crossing). In the pilot episode, Linklater's character, a liberal do-gooder, returns home from a Peace Corps-like stint in South America, via Ground Zero, to discover his widowed mom has married an archconservative family friend. Presented with a new SUV (purchased with proceeds from the sale of his late father's Buick), Linklater's character rails against Caan's: "When you drive an SUV, you're basically telling the President to do whatever is necessary to get the gas for that thing. Including going to war." Birdsong's character, just trying to raise a kid and make ends meet, tries to strike a conciliatory balance between Linklater's and Caan's—though to little avail. Perhaps because of the political hot buttons raised in the pilot—buttons some sources think Americans may not yet be ready to have pushed—or perhaps because there are so many pilots made, Birdsong's show did not get "picked up." No phone call this time. She found out second hand at an industry cocktail soirée. Back to New York. Disappointed, but not despairing, Birdsong was called to audition for a new show for Comedy Central with Denis Leary. A few days later, she sulked into her manager's office thinking she did not get it. "Sit down, Mary," said her manager. "The folks from Comedy Central just called. And they just made you an offer." Look for Mary Birdsong on Contest Searchlight on Comedy Central in August.